A big thanks and a (virgin) Bloody Mary to my buddy Mike Pascale for the sharp-toothed art modifications and basic idea for this gag. On Sunday night, I’ll be posting another Halloween collaboration I did with Mike. So stay tuned, kids—same vampire bat time, same vampire bat channel! Artist unknown. From FIRST LOVE ILLUSTRATED #52, 1955. SCENE: A flight attendant/stewardess is holding a tray of food and looks nervous as a vampire guy behind her looks like he’s about to bite her. FLIGHT ATTENDANT: So, uh…coffee, teA, or <gulp!> me? 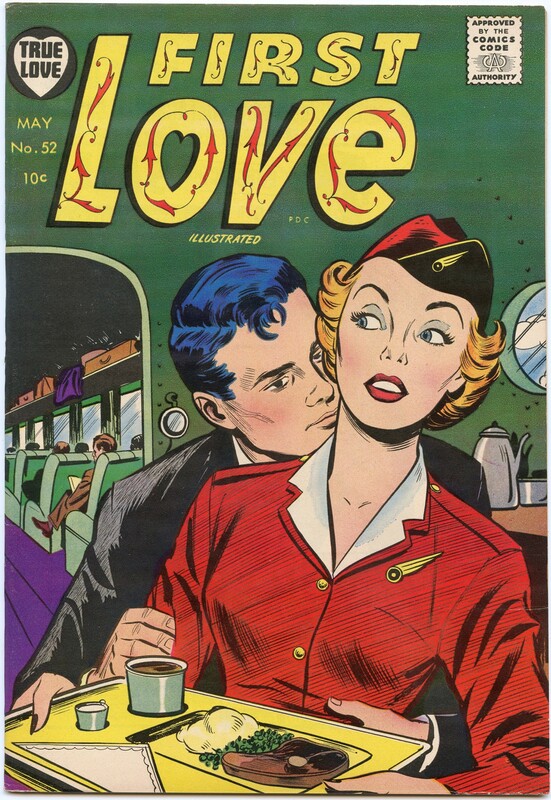 SCENE: A flight attendant/stewardess is holding a tray of food and looks nervous as a vampire guy behind her looks like he's about to bite her. FLIGHT ATTENDANT: So, uh...coffee, teA, or <gulp!> me? Back in the day, you really got your money’s worth flying first class. Another stewardess is hijacked and taken to Cuba. From the Pan Am Stewardess training film, ‘When Weinstein Attacks’. Rail travel was different in the mid 50’s that’s for sure. You know, I was wondering if this was supposed to be a train or bus of some kind. Thanks. I appreciate your shotgun approach to funny comments. Are you a professional gag writer or just a talented hobbyist? Thanks. I guess hobbyist. Mostly when I get insomnia, I get snarky. And I try to fall asleep by coming up with one liners. I don’t comment on the comments often, but I really enjoy seeing what you come up with, Jam. Some funny stuff. And, Dave, same for you!